Sloans & Kenyon was formed in 2003, when owner Stephanie Kenyon and two partners bought C.G. Sloan & Co. Now, with 25 full time employees, Sloans & Kenyon holds several major catalogued auctions each year featuring art, antiques, and collectibles. 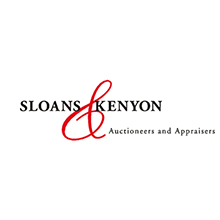 In 2014, Sloans & Kenyon hosted 15 live online auctions with Invaluable.com, where the auction house is a platinum member. The auction house attracts notable art pieces, and in 2009, Sloans & Kenyon sold an 18th century unsigned oil painting of the Grand Canal in Venice for $687,125. It was originally estimated to sell for $6,000 to $8,000, but is believed to be the most expensive painting ever sold in the Washington, D.C. area. Other important sales from Sloans & Kenyon include Frank Lloyd Wright drawings and an 1860s walnut bed similar to the bed in the White House's Lincoln bedroom. Sloans & Kenyon's leading sales departments include art, antiques, and collectibles, but as an estate auction house, they have a wide variety of treasures available. Other specialist departments include silver, English and continental furniture, Americana, jewelry, arts and armor, and books and manuscripts.